It was 2004 and I was living in Orlando. That night Tracy McGrady’s Houston Rockets happened to be playing an ordinary, regular season basketball game against the San Antonio Spurs. That was… until it wasn’t. This was back when Manu Ginobili had hair and Gregg Popovich was only a slightly ornery basketball coach. With the game seemingly out of reach, I walked outside to take out my trash. I walked back inside a few minutes later to realize that the Rockets, down by eight with less than a minute left, had come back and won the game. Tracy McGrady had just scored 13 points in 35 seconds and I had missed it! That’s what I get for doing chores. Do yourself a favor and watch this video in its entirety. It goes far into proving my point. In 1994, I watched the annual Florida-Florida State game with some friends, one of whom happened to be a Seminole fan. Nobody’s perfect. That year, the Gators had taken a commanding 31-3 lead. It was to be Steve Spurrier’s first ever win in Tallahassee. All seemed lost for FSU and my Seminole friend stormed out of the house, refusing to watch any more. What he missed was one of the most improbable comebacks and what remains to this day one of the most painful games I’ve ever endured. Perhaps I should have been the one who stopped watching. I bring all this up because an interesting thing happened to some friends of mine the other night. As it turns out, nobody is immune to a little premature debarkation. They might not live that one down for a while. 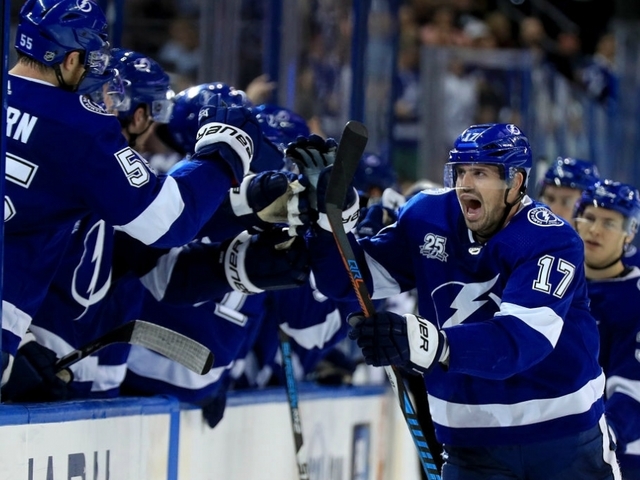 In spectacular fashion, the Bolts came back and won the game 4-3. The face painters weren’t alone in leaving early that fateful night that may have just turned around a season. Even our beloved Dr. Milhouse decided he had seen enough, opting to go home and drink scotch and eat ice cream instead. It’s the post-game meal of champions… and premature debarkaters. Fortunately, he turned on the tube to catch the end of the game. The Bolts comeback wasn’t even the biggest collapse of the night. Up by two with the ball at the free throw line, the Oklahoma City Thunder had sealed up victory in Boston. That was until Carmelo Anthony missed both his free throws and Marcus Morris hit a three-pointer at the other end to give Boston the victory and remind ‘Melo just how empty his NBA career must seem. Want more? Last weekend, Cincinnati led Nevada by 22 points in the second half. The game was a wrap… until it wasn’t. Nevada advanced. It was the largest second half comeback in tournament history. New England over Atlanta, Cavs over the Warriors, Frank Reich over the Oilers. Comebacks happen and when they do, we don’t want to miss them. So, what’s the moral of this story? If we haven’t already learned anything from Chicago, Yogi and Lenny, we may never. Maybe one day, we’ll all get the message. Until then, let’s hope that sport keeps reminding us how wrong we can be when we tune out early so that we can all have fabulous tales of regret to share. This entry was posted in Featured, Hardwood, Life of Sports Chump and tagged Dr Milhouse, Face Painters, Florida Gators, FSU, Houston Rockets, NBA, Steve Spurrier, Tampa Bay Lightning, Toronto Maple Leafs, Tracy McGrady by Chris Humpherys. Bookmark the permalink. Don’t you guys have a singing fat lady to signal in fact when it is over? There’s a reason why Tracy MxGrady is now enshrined in the Naismith Hall of Fame. Point well taken…………premature is not good in many facets of life. Most of those ladies have been discredited considering their long sexual histories with me. As you well know, I was living in Orlando during the Tracy McGrady Magic years. Just wish he would’ve had a little more help. Unless of course you’re late for a movie. Then ya’ gotta do what ya’ gotta do. I left a Dodgers game vs SD back in 06. 4 straight HR’s to tie it, Nomar walkoff HR in the 11th. Only one of the greatest comebacks in MLB history. I sarcastically replied, “yeah it is” and left thinking what an idiot he was. I heard the cheers of the 1st HR as I got to the car, but didn’t turn on the radio. I didn’t find out the outcome until the next morning. Needless to say, I’ve never left a game early since. So Bleed, is the moral of the story to always listen to a fat Mexican? I guess I can go with that. That T-Mac trade would have been epic for sure. I remember the day the Magic were going to sign Grant Hill, T-Mac and Tim Duncan. They were going after Timmy hard but couldn’t close the deal. Remember the whole Doc thing about family not flying on the team plane fiasco? Had that happened, I had my finger itching on the trigger. Season tickets would have been mine for shizzle. As it turns out, the Magic fumbled their way through that transaction as they’ve done with everyone since then. It’s why they are where they are right now. Should be an interesting playoffs coming up, Bleed. Big comebacks are awesome to watch. Admittedly, sometimes I come to the party after hearing elsewhere a game has started to tighten up after being reported as a blowout…but it is so cool to watch an entire game and go from “I have to turn the channel” to “Oh, my God” mode. Pretty good tourney in retrospect, Burnsy. That Nevada comeback was insane. In the end, though, it’s hard to argue the best team didn’t win. All six wins by double-digits? That ain’t bad.